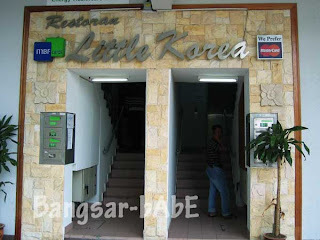 rif finally took me to Little Korea for lunch today. We ordered the Beef Bulgogi (for 2 pax), Kimchi Jjigae and Mo Dum Ku Ee (for 3 pax) to share. In case you thought we were insane gluttons, rif’s parents were also with us. 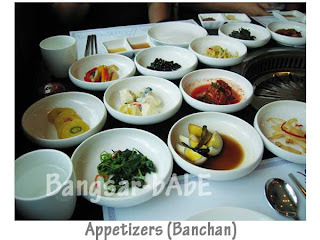 😛 We started off with the appetizers (Banchan). I think there were about 15 types of appetizers (all refillable). My favourites were the Kim Chi, potato salad, potato pancakes and steamed egg. 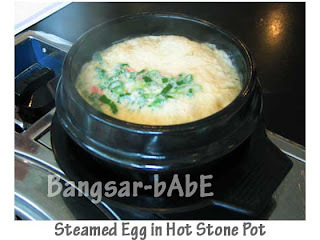 I liked the steamed egg (in hot stone pot) a lot. 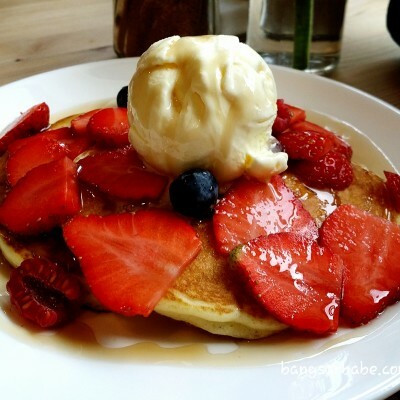 Very comforting and tummy-warming. 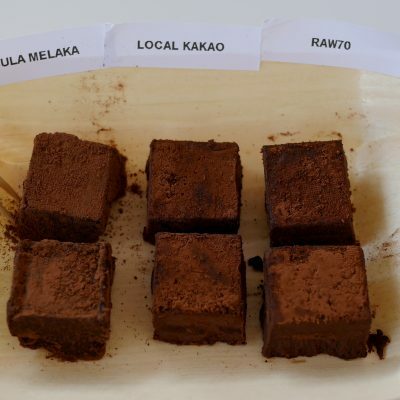 It has to be eaten fast though, as the bottom gets burnt if left for too long. We had one waiter to ourselves, and he did all the grilling for us. 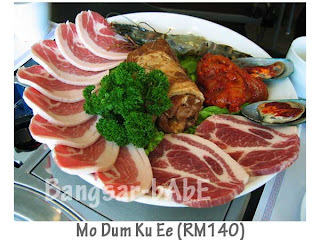 The Mo Dum Ku Ee consisted of belly pork, pork shoulders, chicken and seafood (a big prawn and two mussels). The pork belly was really really delicious! Thinly sliced, it was absolutely juicy with chewy and slightly “crunchy” fats. The pork shoulders were also pretty good. Well-marinated, the pork pieces were very tender and full of flavour. Dipped it in Korean bean paste sauce and I was in porky heaven. The seafood and chicken were decent. While the prawns were fresh and crunchy, I wasn’t wow-ed by it no thanks to the delightful pork feast earlier. The chicken was marinated with plenty of kim chi and chili paste. It tasted good, but like I said earlier, the marinated pork stole the show. The beef bulgogi had oyster and straw mushrooms, glass noodles and spring onions in it. The gravy was sweetish and went very well with rice. 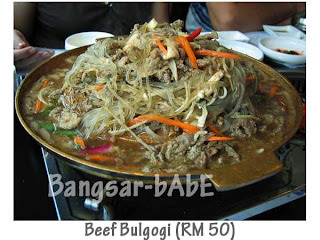 The beef was extremely tender and the onions were beautifully cooked till soft and translucent. The glass noodles gave a nice chewy texture to the dish. 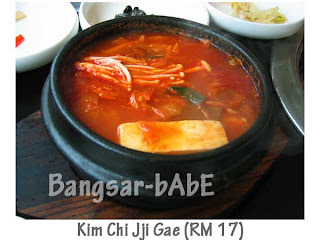 The Kimchi Jjigae was piquant – it consisted of pork, tofu, glass noodles and cabbage in thick Kim Chi broth. I found it lacking tang and would say it’s on par with TongKun’s Kim Chi Jjigae. Haeun Khon still takes the cake for excellent Kim Chi Jjigae. 😛 Desserts were also complimentary. 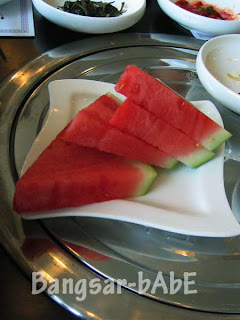 We were given a bowl of sik hae and a slice of watermelon each. 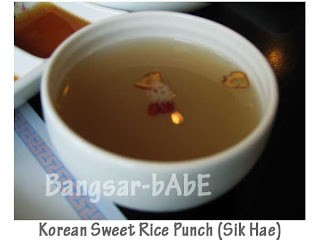 Sik Hae is a Korean Sweet Rice Punch served after meals. We all thought it was very refreshing and liked it a lot. At the end of the meal, I was stuffed! Maybe we did over-order a bit…hehehe. All in, lunch came up to RM 238.70 inclusive of 10% service charge for the 4 of us. Pretty expensive, but for the fantastic service and good food, it was worth it. Thanks for lunch rif! Verdict: DAMN SHIOK KOREAN FOOD! rif was so right!! Try the barbeque meat platter (Mo Dum Ku Ee). You’ll probably end up smelling like sizzling meat, but it’s oh-so-worth-it! Great selection of appetizers too! 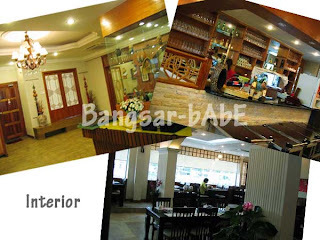 yes its a bit on the expensive side, but if you want quality meat & service you cant be stingy.